Pochonia parasitizes the eggs and females of plant-parasitic nematodes (PPN). The fungus-nematode interaction involves a complex series of events which can be affected by the environment. Thus, an understanding of the bionomics of this interaction is essential in order to improve the efficiency of the biological management of PPN. In this chapter, we provide an overview of the process of infection of nematodes by Pochonia and the role of the environment on the fungus-nematode interaction. Firstly, we focus on the events and the mechanisms underlying adhesion, penetration and colonisation of nematodes by Pochonia. We discuss how the infection process is driven by both mechanical forces, induced by the appressoria, and enzymatic activity, specifically by the serine proteases (P32, VCP1, SCP1) and chitinases. 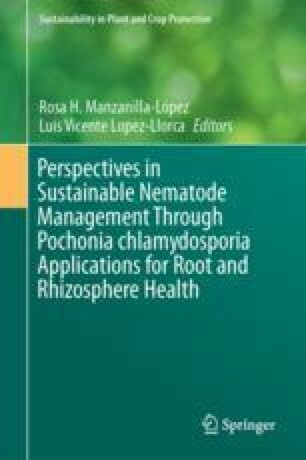 Environmental factors have a profound influence on the Pochonia-nematode interaction and these are discussed in detail. Temperature, pH, soil type, soil microbiota and roots can enhance or reduce the parasitism of the nematode by the fungal antagonist. Finally, we discuss how the method of application of Pochonia and its timing can impact on the establishment of the fungus in the soil and, consequently, on the control of nematodes.